Pasta de Waraku @Changi Terminal 2 (Singapore) | Get Your Grub On! I don’t very often write about big chain restaurants as I most of the time don’t think too much of their food, not enough to write about them anyway. One exception is the ‘Spaghetti alla Bolognese‘ from ‘Pasta de Waraku’ which I throw in once in a while, like today at our pit stop at Changi Airport. 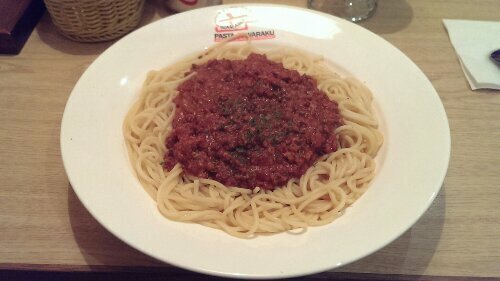 The pasta as always came out a tiny bit too soft but was still very enjoyable and plenty and the Bolognese sauce was rich and meaty and had this particular sweetish taste that I liked a lot. I regretted a bit not to have tried it with the egg yolk but there’s always next time. They also gave us a tiny salad to start with which wouldn’t have been anything special if it weren’t for that awesome wafu dressing they drizzled over it so that I actually wished it could’ve been bigger. Setting and service is rather unmentionable, it’s just simple, no fuzz, good.